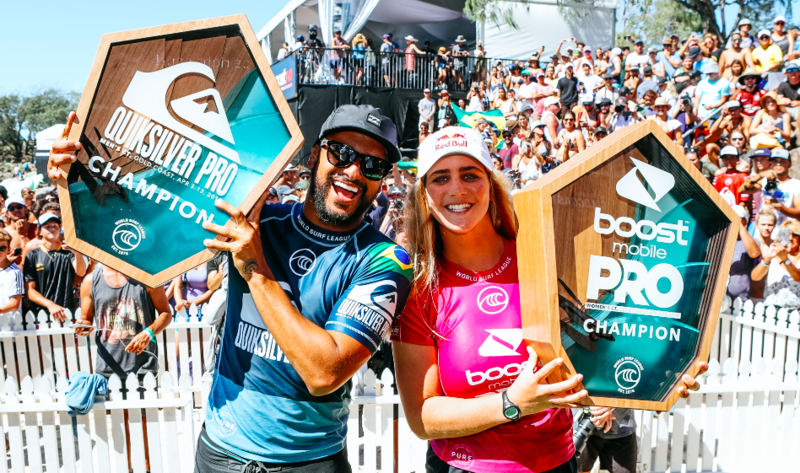 No point in dissecting and breaking down what you already know, Italo Ferreira and Caroline Marks are the 2019 Quiksilver Pro and Boost Mobile Pro champions. Ferreira and Marks are both pedigree performers, no doubt. I’m not denying them their deserved glory and limelight stock, but let’s also take a look at some other back stories which unfolded on the Goldie. Events that may at first seem obvious, but whose outcomes have far reaching implications. Let’s tuck right in shall we. I’m probably going to take some heat for saying this, but the 2017 version of Jordy Smith would have folded when running head on into the immovable object that is 2 times World Champion, Gabriel ‘Machina’ Medina in the Quarter Finals. But this is a different Mr. Smith. A sharper, more accurate and, most importantly, exceedingly confident athlete. The manner in which Jordy Smith held his own against Medina, who was breathing fire from the moment he hit the water in round 1, was not only impressive from a purely technical surfing ability slant, but it showcased Smith’s unwavering intention to close heats. Big, clutch heats. And they don’t get more intimidating than going toe-to-toe against a rampaging Medina. Scrub through the heat right here, watch the BMT and assuredness of both performance and mental fortitude to hold Gabriel at bay. Another big point of difference in Jordy’s approach is a return to one of his most prized assets: the air game. It’s always been up there with the best, but strangely enough, it wasn’t presented with high enough frequency in the past. But it’s back. And for me, it is most welcome. Smith’s airs are lofty, lanky and the landings clean. No foot slides or uncomfortable stop starts. And if the air game was tight against Gabriel, it went stratospheric against Italo Ferreira. Both athletes pushed hard. Italo was the pace car with a risky rotator to open his account but Jordy’s counter, a fully tweaked out , lighting fast version on a bigger wave netted him an 8.67. Could it have been a 9? Should it have? Check the heat here. It’s well worth it. Eventually, Italo won the duel, but it’s safe to say, Jordy Smith is in a commanding position to push hard for a win at Bells and will be more than happy to leave Australia with a scorecard that has the potential to read 3 and 1. And the passionate South African fan base will grab that with open arms. Take a bow Jordy, you’re on a hot streak. Haircuts are happening right now. It’s not likely you can ask for a ‘John Florence salty perm with reverse mullet’ at your local barber shop, but if you could, it would be a popular choice. JJF has returned looking sharp, loose, flexible and a little angry. That’s the surfing, not the haircut. 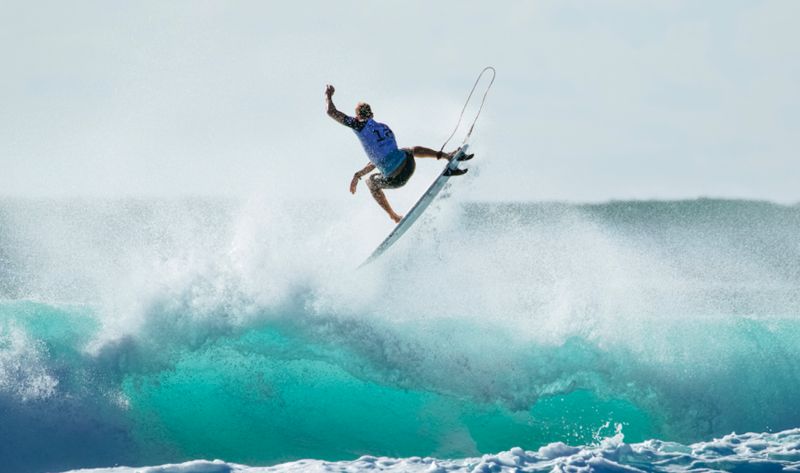 The two time World Champion’s performance in the 2019 Quiksilver Pro was a testament to his relevance to the sport. He’s needed for all the right reasons. The range of performance, the variety of skill set, a different style to the cookie cutter conventions of the over trained competitive surfer. Like Jordy Smith, the likeable Hawaiian is well teed up to go into Bells knowing a final is very much a possibility. FBT. Fooled By Trailer. It’s what happens when you get suckered by an enthralling, gripping and suspenseful trailer to a film, that has none of those qualities. You realise, 10 minutes in, you’ve been duped. All the good bits, were in fact, in the trailer. An A list cast and Academy Award winning Director doesn’t mean anything if the feature fails to compel. The trailer for Return of the King, Kelly Slater, at the 2019 Quiksilver Pro was dramatic, and most definitely worth watching. The 11 times World Champion starred in many clips leading up the event. Interest was piqued, it was time for the main show. Unfortunately, Slater’s performance was not up to task as he was bundled out in Round 2. In my opinion, Kelly Slater will always be relevant. Despite the sharp upward curve that we’re seeing from the current leaders of the sport, one cannot deny Slater’s GOAT status. I won’t repeat the Occy similarities that have run their course, there’s a lot more to Caroline Marks than that. It feels unfair to ‘copy and paste’ her approach like that. It’s lazy. And that’s a word you don’t associate with her approach to competing and her savage and brutal power surfing. Throughout the event, Marks never looked to be out of control or at odds with syncing up those big hooks, right in the teeth of every section she found. Watch the final here, if you can find fault with her timing, fluidity and composure, please hit me up. Will Gabriel Medina strike back at Bells Beach, what about Julian Wilson and Filipe Toledo? Has Jordy Smith already booked an appointment with the dentist to ring the bell again? Will John Florence continue to attack and how many people will get their popcorn ready to watch, The Return of the King part 2, starring you know who. I’ll be watching from the couch, and as always, look forward to your company. Awesome report and Jordy looking SO good! Definitely a shift happening there. Could this be the year!!!???? Excellently written. As compelling and entertaining as always. As boringly good as watching Rossi on a motorcycle, which looks really easy..when HE does it. Great article, lots of talking points as usual, judging always debatable. With Jordy’s heat, yes, his 8.67 could have been higher, but couldn’t have Italo’s 8.00 also been slightly underscored? And what you reckon about the buzzer beater score in the final Chairman? I think the judges will be happy to be going to Bells, less 1 manoeuvre waves and degrees of rotation to try and work out! There has been a lot of discussion regarding that final and the ‘underscoring’ of Andino’s waves. Most of that has revolved around the overscoring of air rotators . It’s a good point. Andino couldn’t have surfed a more complete final and can feel bummed it didn’t go his way. An excellent read as always, shot! I’m certainly hoping Jordy chips his tooth again, ring-a-ding-crack!! That was really well written- nice one Pie! Jordy surfed really well and looked to keep things loose and spontaneous. If he goes that way all year, he’ll have a great season I think. The level of surfing these days is unbelievable. It’s like a different sport to what you see at the local beach! Interesting thing too is the 2 highest rated airs/guys in the Airborne were Italo and Felipe. They were bloody untouchable. That says a great deal about the current level, and the sort of stuff any of the competitors can land these days. Great read as always Glenolds. Looking forward to Bells. Stoked to see Jordy having a really good start to the year, he will threaten at Bells. Bring on Bells and in no way do I believe the bell has already tolled for our loveable GOAT… Watch… and learn grasshoppers! Jordy surfed a great contest and it is a pity that, only the ocean, denied him in his heat against Italo. JJF is back!! Medina and Kolohe are both going to be at Bells, pissed off and wanting to extract revenge… Here’s hoping the swell and waves meet their wrath head on! Great write up Mr Drysdale. You are spot on. Jordy is looking much better this year. Even at the end of last year, he almost beat Gabe at Pipe, which was a massive improvement. Still unconvinced he can go the distance. He has a obvious glaring flaw in his surfing. Big grinding Left hand tubes. It’s what cost him his heat against Gabe at Pipe. What was an epic standup backhand tube for any of us, if it was Gabe or JJF, they would have dragged and stalled to get deeper. Medina and JJF much more comfortable in the tube backhand. I am just surprised that Jordy doesn’t do what the Coolie Kids did. Mick, Parko and Dingo realised earlier on, that they were very good in right hand points, but sucked riding backhand tubes, so every year, in the off season, they would spend a month in Indo, teaching themselves backhand tube riding. Parko and Mick have both won in Tahiti, and Dingo was an epic backhand tube rider. Until Jordy works out that flaw, he sadly will never be a world champ. Your point of the change up needed in approach is valid . Jordy has certainly sharpened up his act in the thicker lefts , as obviously his natural strength leans toward right walls. I think the victory over ‘Machina’ Medina speaks volumes. That stuff stays with you as a competitor, you remember the sequences leadng up to victory. Onwards to Bells and thanks for the feedback. Thoroughly enjoyed reading the report Glen – accurate and so insightful as always. Really looking forward to your Bells roundup!